Super Hero Boy: There is no cooler kid in the lunch room! There is no cooler kid in the lunch room! I remember the lunch boxes of my youth.. metal tins with things like Dukes of Hazard, my beloved Rainbow Brite, or of course the coveted Transformers. The only issue with this was for the first part they rusted and the metal was a danger in itself as I can't even tell you how many times I pinched my fingers on the latches. The really bad part was the fact that no matter how unique you think you are, someone else, if not half the class would end up with the same lunchbox as you have! 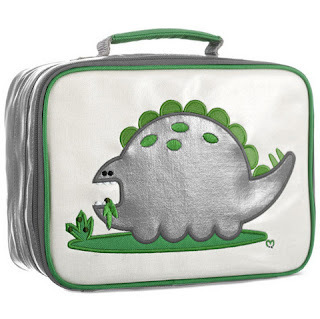 If your looking for something unique as your child that truly inspires the imagination and will be the envy of all the other kids in the lunch room you really have to check out the the great selection of lunch boxes at Dante Beatrix. We own several bags from Dante Beatrix and I am constantly getting comments on Connor's Dante Beatrix backpack which I carry around as a diaper bag! All of Dante Beatrix's bags are made with the utmost care. We have been incredibly pleased with our other Dante Beatrix bags which are in daily use around here. I'm excited to send Connor off to preschool with his new Dante Beatrix Alister lunch box and I love the fact that's made of laminated canvas as it will be super easy to clean, after all it will have to stand up to sticky preschooler jelly fingers. Check out the entire selection at the Dante Beatrix website! I remember the metal lunch boxes with the little thermos too; These are so very cool, my favorite if the "Juju"